In the early 1980’s I started to import genuine ‘Japanese-made’ garden lanterns (nowadays all made in China) because of customer demand. This involved visiting some Japanese companies who actually machined these items from various types of granite. I had to learn the names of different types and then had to advertise the different styles by their names in my catalogues. On one visit, the manufacturer presented me with his gift of a ‘Natural Yukimi’, which was a beautiful four-piece lantern, sliced precisely from a seam of volcanic rock and could not be compared to the standard machined lanterns as it was totally unique. It was much heavier than the other lanterns and some 20” of the large base had to be bedded below ground to achieve the desired effect in a garden. It was a truly spectacular sight when placed on display. At the same time I also imported bamboo garden accessories, one being a ‘Shishi Odoshi’ or ‘Deer Scarer’ that I installed on display to supply water to a stone bowl complete with a long-handled bamboo drinking cup. The water trickled into a bamboo pipe that was on a pivot, when the water reached a certain weight it would tip over and supply water to the bowl below. After this, the pipe returned to the normal position stopped by a stone below it. 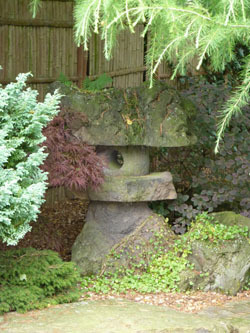 The noise made by the bamboo against the stone was a loud click, said to deter deer from straying into the garden and demolishing a collection of 450 year-old bonsai? We promoted it in this way by placing a sign below it, which read ‘You will not see one single deer in this building’. Tommy Bradshaw from Liverpool was a Koi maniac of the day who had a truly wonderful income by way of re-packaging ladies tights (factory seconds) and he retailed them by the thousands at various markets around the area. His wife Lil played a great part in the packaging of the items for sale. Tom could also turn his hand to most things including building Koi ponds. Tom was also into Japanese gardens in a big way and when he saw the lantern, he set his sights on it. He was also fascinated with the actions of the deer scarer. In the end he bought both and whilst we had the necessary labour to load the lantern on his truck, we often wondered how he’d get it off at the other end and then get it some 50 yards into his back garden. A few weeks later Tom came back to the shop for food and other items. I asked him how the lantern looked next to his lovely pond and he said it was superb, then related to me how he came home a few days after he’d set it up to find Lil next to it in the garden. She had a paintbrush in her hand and a tin of pink emulsion paint that she was stirring carefully. Tom rushed over and asked her what she was about to do, Lil replied by saying – ‘I thought it would look nice painted pink, to brighten it up a bit’ – I can imagine the local words that Tommy used to stop her, these words were then used by Liverpudlians in normal conversation – but not exactly BBC standards in those days! Thankfully Tom saved the lantern. In 1997, Tommy & Lil moved to Spain, before he left he rang me to ask if I knew anyone who would want to buy the lantern. I always regretted selling the lantern and my own pond at home was well on the way – I also knew exactly where I would place it in the garden. I offered him exactly what he’d paid for it (£650.00) knowing full well it would cost me four times that figure if I had to import it from Japan then. And that is, if I could ever find another one so beautiful. This is the very lantern, it is purposely, partially concealed from view under a tree; weeds have been ‘cultivated’ all over some surfaces but it is a joy to behold. And it also has one hell of a tale behind it!